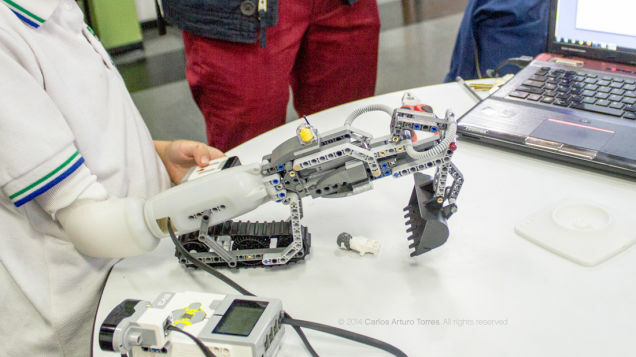 A modular twist-and-lock port attached to this customizable prosthetic lets children adapt, modify and create attachments to serve both fun and practical functions. Developed by Carlos Arturo Torres Tovar of Umeå University in Sweden, the IKO system comes with a default three-fingered grip but it can be swapped for anything created out of LEGO by the child or their friends and family. Thanks to the versatility of the LEGO family of toys, the possibilities are virtually endless. The attached pieces can be built out to whatever extent desired, lit up by battery power and even motorized, turning missing limbs into a unique chance for creative expression and playful interaction, letting kids build confidence and make new friends (as well as arms). From diggers and space ships to ray guns and spinning fans, if it fits in a child’s imagination it will work on this modifiable appendage. See more in Cybernetics or under Technology. July, 2015.